Posted by Shane Ryans on February 26, 2013. Google will first ask you if you want to start using enhanced campaigns now. Confirm that you would like to begin using enhanced campaigns. As you walk through a few more steps, agree with all prompts. Google will then ask “Start Now?” Answer yes. Also, note that when you enable enhanced campaigns, your cost-per-phone-call (CPP) bidding will be elimnated, but you will still be able see the metrics for CPP. We decided to focus on our client, Auto Mobility Sales (AMS), providers of wheelchair accessible vans and other mobility products. AMS’ particular sales system works chiefly by phone. With three Florida locations, Auto Mobility Sales relies heavily on the mobile phone, as customers search for other locations on their phones. Because their sales depend mostly on phone calls, we also set up a phone system, called Ifbyphone, which tracks conversions made through phone calls. Currently, we are only able to adjust bids on mobile devices and locations, as AdWords slowly rolls out all the features of enhanced campaigns by mid-2013. Auto Mobility Sales’ heavy reliance on mobile phones has been our primary focus for experimenting with enhanced campaigns. 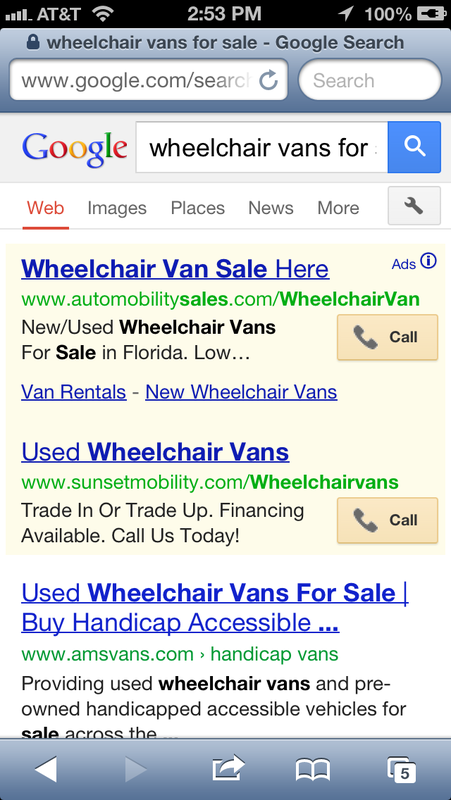 Although Google suggested we lower the cost-per-click (CPC) for mobile, we decided to raise it by 50 percent. The reasoning behind this is that when people search on their mobile devices with full browsers, having an ad appear in position 3 or 4 is pointless, as only the first 2 positions typically appear on a smartphone. Notice below that Auto Mobility Sales is in position 1. We decided to raise the bids for mobile devices with full browsers by 25 percent due to the importance of mobile to sales for AMS. The ability to use precise targeting for mobile is a feature we strongly believe will improve our campaigns for Auto Mobility Sales. Click on image to zoom. We also raised our location bids in Miami, Fort Lauderdale and Broward County by 25 percent to target prospective customers in the areas Auto Mobility Sales receives much of its business. Click on image to zoom. Although we have noticed that out CPC has lowered despite raising bids on mobile (we suspect this is because competitors are not yet using mobile bidding), it’s still early, and we’re still waiting to see how mobile device and location targeting will perform for Auto Mobility Sales. 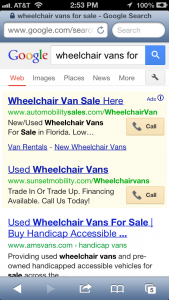 As we work with Google AdWords enhanced campaigns more, we’ll report back about its effectiveness.